I have been busy making robots. The designs I really like are those by robot sculpter Mike Rivamonte, his influence is seen in these. After viewing many pictures I blended several styles into something I could actually build in a reasonable time using standard woodworking tools. These are the first six. Several of them have pins in the top of the head, black and one red. Thats what I came up with for the antenna. The featured shorty bot has a flashlight bulb I found in my junk drawer and everyone seems to prefer that. The bulbs cost about $1.50 each, thats another reason I used pins on the others. I am thinking of making one of these bots with the back removable and a battery inside to power the light, or even LEDs for the eyes….lots of ideas still kicking around. Maybe little jet packs or back packs? There are lots of options. I tried little faces; painted eyes and a smile and even googly eyes, but for now I like this effect. The smaller bots are about 2 1/2’’ tall. They remind me of Wall-E for some reason, so I will be adding a set of tracks to the next set. This gives it more life, at least to me. The arms pivot full circle. I tried several paints and settled on some auto paint I had in the cabinet. I first painted them flat black as a base coat then used some antique brass, silver, pewter and a bronze. To knock off the brand new look I brushed on some latex flat black craft paint and wiped off most of it, leaving it in the joints and as a glaze over the surface. Rub'nBuff works great for adding an aged patina, and it comes in many colors. I did all of my cuts on the bandsaw. I will use maple or beech next time to prevent splitting. I didn’t glue in the legs or arms, they fit very snug and this allowed me to paint before assembly. I drilled two 1/4’’ holes in the body for the legs about 1/2’’ deep, in about 1/4’’ from the edge and centered front to back. The legs are 1/4’’ dowel. I waited until I made the feet to determine the leg length. I wanted this squat look, so these legs are about 1 1/4’’ long. You will need some 1/2’’ thick maple for the feet and arms. All the feet were drawn onto one board after making a test foot, which is a taper front to back. The front of the foot is about 7/8’’ wide x 1 1/2’’ long x 1/2’’ thick. Drill your 1/4’’ hole about 1’’ centered from the front of the foot and centered side to side. I drilled all the holes about 3/8’’ deep and before cutting them out. After cutting to shape you can sand them to a profile you like. The arm holes are about 3/16’’ and down about a 1/4’’ from the top, centered front to back. I used axles that you can get at a craft store like Michaels or probably online. They are metric and you will need to play around with a test piece to get the axle to fit snug in either the body or the arm so it will pivot but stay where you want. This was the only real difficult part. You need to be careful tapping the axle through the arm, I cracked two of them. I filled the cracks with CA and sand smooth, paint made it look good. I drew up an arm with a bend at the elbow, just do what looks good to you, even straight will work. I cut the arm thickness down to the hand which is full thickness of the blank and then cut a kerf to form a palm. Its just up to each persons individual taste. Very fun looking projects, Andy! Very cool…soon we’ll all be following in your footsteps!! How Fun! Limited only by your imagination. You must be having fun with this. Cool little army you’re building there. I remember playing with little plastic green Army men as a youngster, the kids today will no doubt prefer these! And I did not think of Wall-E when I saw these, My mind went to the old toy we played with as kids Rock’em Sock’em Robots ! Thanks, glad you like them too! These have been a fun project and everyone loves them. I have given away the tall one (Arvin) and the one with the bulb (Rob). The others will be going soon. 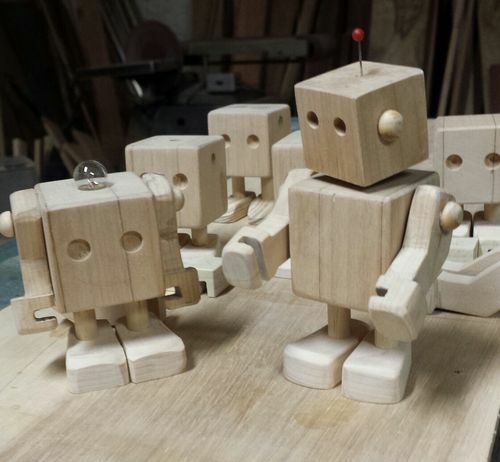 Here is a shot of the robot family before they were painted which might clarify how they are made. Here is something I discovered by accident when my coworker Darlene said ” Wouldnt it be cool if they could hold business cards?” Just a little carefull planning and check your palm kerf prior to assembly. 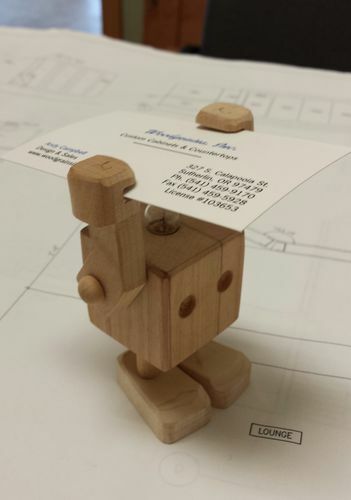 If you put his “hands” to his back the business card will be stacked behind him, and people will still be able to see both the cards PLUS the cute little droid holding them. I’ll bet these would sell at the “Arts and Craps Shows” so many folks on here go to. Thats a great idea Joe, go for it! What a Change of Pace this is! It will be interesting seeing how you incorporate the electronics, switches, circuit boards, etc. Very nice… Thank you for sharing your new sideline! Andy…...love ‘em. My grandkids will, too. I will have to eliminate the bulb and the pin, though..too dangerous. They remind me a bit of those little Lego people, especially the hands. Those are really nice Andy...reminds me of some metal toy robots (Robby the Robot) I had as a child. I recently saw some small robots at a co-op gallery that were made of all different types of salvaged metal and had LED lights and a tiny battery pack. They ranged from about 4” tall to about 24” tall.. They were really nice…but they were not made of wood. Dave, I am getting a little woried too. I had too much fun playing with these toys, at least they arent Ken and Barbie…...hmmm, I wonder if I took some scraps and….. Remember Wal-e had E-vea. Like most women she was more complicated, and aerodynamic. LOL!